Two years after Iran connected its railroad with Central Asia, the Central Asian countries have dominated the rail transit through Iran with a share of over 90 percent. Iran, Turkmenistan and Kazakhstan connected their railroads together to link Central Asia to Bandar Abbas port in Persian Gulf in 2015. Currently the transit capacity of the project is 3 million tons per year, or a third of final capacity. The project would become full operational after the trains are electrified and some other work carried out in northern mountainous regions. The latest statistics indicates that Turkmenistan holds a 60 percent share from railroad transit through Iran. Mohammad Hadi Ziaei Mehr, an official with Iranian Railways told IRNA on Dec. 18 that over 960,000 tons of goods were transited through Iranian railways during the first eight months of the current fiscal year (started March 20). 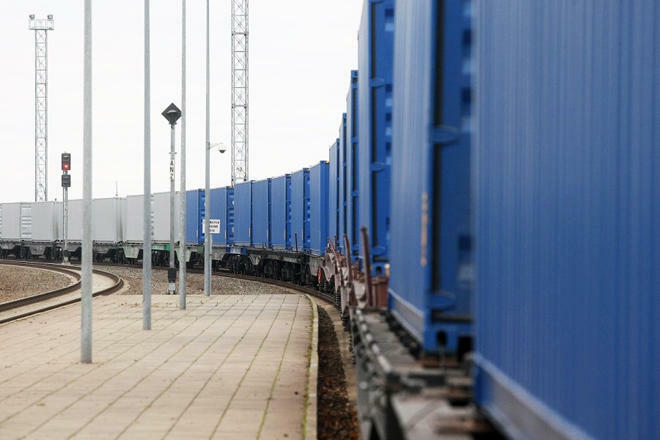 Over 770,000 tons of the goods transited by Iranian railroads during the 8-month period belong to the Central Asian countries, 80 percent more year-on-year, Ziaei Mehr said. Some 580,000 tons of transited goods in the period were loaded from Turkmenistan, which is equal to 60 percent of the total cargo transited via Iranian railroads, he added. Uzbekistan with a 33 percent share stood at second place, followed by Tajikistan, the official said. Sulphur (over 80 percent of the total volume), fertilizers and oil products topped the list of the transited goods from Turkmenistan, he said, adding that some 95 percent of the goods were transported to Bandar Abbas port. He added that Iran has given 15-50 percent discount in transit fees for Central Asia countries. According to Hossein Ashoori, board of directors’ member of Iranian Railways, Iran’s railroad transit has registered a 61-percent growth during the current fiscal year, started March 20. During the 9-month period, some 1.015 million tons of goods were transited by Iranian railways, he said, adding that the figure is expected to reach 1.6 million tons by the end of the current fiscal year (March 2018). Iran plans to increase the transit capacity through railways to five million tons by 2021.